The Gill St. Bernard’s girls’ tennis team had a great run at the Somerset County Championships this past weekend as the Knights placed fourth overall and had multiple players advance to the second day of competition. The Knights, who are ranked 14th in the state, had players move on to the knock-out rounds of the tournament in first singles, second singles and first doubles. 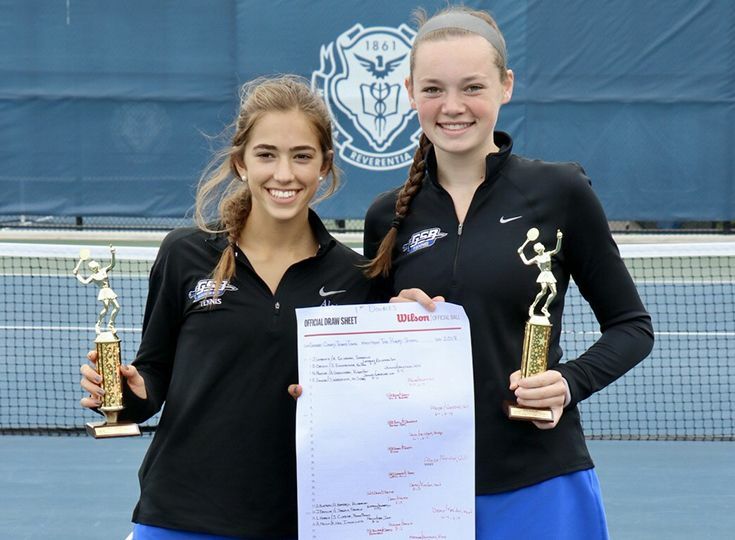 The highlight of the championship came from teammates Andree Aloise ’19 and Tori Goldin ’20 as they took home the county title in first doubles. Aloise and Goldin were the top seed in the tournament, and they defeated the team of Risha Patel and Polina Odintseva from Bridgewater-Raritan, 6-1, 6-4. “The doubles team was seeded first and the girls performed to their potential and had an awesome showing,” said head coach Patrick Hensley. Also having great runs during the championship were Mayjah Jean-Pierre ‘21 and Ella Baker ‘21. Jean-Pierre lost to Ishika Shah of Franklin in the semifinals of first singles while Baker also fell in the semifinals to Nitya Subramaniam of Bridgewater-Raritan in second singles. The Knights’ next championship will be on October 4 when the state tournament begins.